Grab your snorkel and flippers as its time to dive into the ocean and navigate your way to the bottom in search of big shiny pearls that are hidden inside closed clams – and you’ll be meeting lots of quirky characters who live in the ocean along the way! Neptune (who is the God of Seawater) and Marina (who is a stunning mermaid) watch as you swim your way through the ocean with sharks to avoid and octopus celebrating your wins by doing a funky dance. It’s an online slot packed with bonus features as you’ll enjoy a pick ‘em Scatter game, free spins mode, gamble mode, plus the EGT Jackpot Cards feature! This underwater adventure is played out across 5 reels and 15 paylines with a return to player percentage that is just as friendly as the characters you’ll meet at the bottom of the ocean, standing at a generous 96.36%. In addition to that there are equally friendly staking options available as you can opt to risk 15, 30, 75, 150, or 300 credits each and every spin! You’ll want to take a water resistant camera with you as you go deep sea diving in the Ocean Rush slot machine as you’ll encounter lots of quirky characters along the way who you’ll want to remember as they help you celebrate winning combinations - with all twelve symbols being fully animated. The most valuable is an angel fish which is the Wild symbol possessing the ability to substitute for both the Scatter and Bonus symbol, paying out double when it substitutes, and shooting off with a menacing look on its face when it spots its dinner. The Scatter is a pearl in a clam while the Bonus is simply Lucky Dive text on water. Both Neptune the God of Seawater and Marina the mermaid keep watch over you as you navigate your way through the ocean, plus you’ll also encounter a fearsome shark, a funny crab, an octopus who breaks into a dance, conch, a starfish that flutters her eyelashes and gives you a kiss, a blue fish, plus a treasure chest full of gold coins. As you can see, it’s certainly best to trigger the Lucky Dive feature as the cash rewards that come with it are even bigger! Landing the Lucky Dive bonus symbol on the third, fourth and fifth reels during the same spin, or by gaining access to it via the Scatter game, sees you snorkel your way to the ocean bed for an exciting free spins feature with multipliers that see you reach the surface with huge wins in toe! Firstly, you’ll have to pick from shells on the ocean floor in order to accumulate free spins and an increased multiplier value, with you continuing to pick until the ‘play free spins’ symbol is revealed. Initially you can start the feature with 7 to 20 free spins and a multiplier of 1x up to 5x, but the feature can be retriggered for even greater treasures! 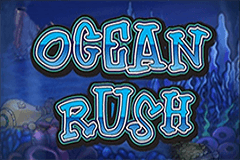 Ocean Rush is certainly one of the most fun online slots released by EGT. It boasts a colourful design, is full of bubbly ocean characters that you encounter as you search for valuable pearls, and offers both a Scatter game and free spins mode in addition to standard EGT features making it a slot you will be definitely be rushing back to play!